Delirium, a life-threatening preventable complication of hospitalization affecting the elderly population, has been linked to persistent functional decline, increased length of stay with associated costs, a greater likelihood of nursing home placement, and higher mortality rates. Yet to date, delirium remains often unidentified. Delirium leads to poorer surgical outcomes, higher rates of injury and complications, and may prolong a decrease in functional status for as long as six months postdischarge. Delirium also has been found to impair communication, cognition, and recovery in the elderly.7 Delirium is a syndrome with a number of multifactorial symptoms and manifestations that hinder recognition without a formal cognitive assessment. These symptoms may include impaired cognition or attention, altered sleep/wake cycles, and changes in psychomotor behavior. Delirium is often thought of as a normal part of aging, which also influences the intent to assess for delirium.8 The significance of reducing delirium's incidence and/or frequency lies in improved outcomes, including shorter lengths of stay, lower rates of injury, improved cognitive function, and fewer complications that otherwise would prolong diminished functional status both during hospitalization and upon discharge. What exactly is delirium? It is a neuropsychiatric syndrome with characteristics of disturbances in cognition and attention, an altered level of consciousness, periods of inattention, and disorganized thinking. The cardinal signs of delirium are its acute and sudden onset with a fluctuating nature.9 Delirium's transient, multifactorial presentation and three distinct types—hyperactive, hypoactive, and fluctuating—make identification challenging. The hyperactive phase is the most recognizable form of patients' delirium with periods of agitation, restlessness, pulling at lines and/or tubes, hitting, biting, and at times requiring restraints for safety reasons. The hypoactive phase of delirium may present as depression or dementia, thus hindering recognition. This patient is lethargic, withdrawn, has a flat affect, and is apathetic. Patients with mixed delirium exhibit signs and symptoms of both hyper- and hypoactive delirium, which may fluctuate between the types. The fluctuating course increases the likelihood that it may be missed in the absence of a formal cognitive assessment. A substantial proportion of delirium cases can be prevented when modifiable predisposing factors, or those evident on admission, and precipitating factors, those that provoke delirium, are identified. Something as simple as a change in environment for an elderly person may precipitate an episode of delirium. Several other factors have been found to predispose patients to delirium, including age, as delirium incidence increases with age; visual and hearing impairments; impaired nutrition; disease processes such as urinary tract infections, pneumonia, and sepsis; and a history of dementia, alcohol intake, smoking, or depression. Two of the most significant barriers to delirium recognition are its lack of visibility and the erroneous assumption that delirium is a benign, normal part of aging. Nurses and physicians typically do not formally identify delirium but instead use casual words or statements to describe delirium behaviors. This unwillingness to call delirium by name as opposed to using delirium descriptor terms is a substantial impediment to implementing established methods of improving care. Delirium will remain invisible due to sparse exposure in both the patient chart and in the media. Patients are hesitant to speak of having been delirious for fear of embarrassment and because of their inability to fully comprehend what has occurred.11,15 Delirium survivors recount episodes of fear, pain, limited understanding of treatments, and the notion that strangers are trying to harm or kill them. Both the physical and psychiatric sequelae of delirium may persist for extended periods of time, and a patient's limited recall of his or her illness or amnesia related to illness is often replaced with erroneous recollections that result in delusional and suspicious memories. Delirium remains imperceptible in health care settings as evidenced by appalling detection rates of 25%. There are several thought processes on methods to accurately assess for and identify delirium. For starters, we must highlight the importance of a delirium assessment and educate health care personnel on the inherent dangers of delirium—it is not a benign disease as once thought. Delirium screening needs to be incorporated into daily patient assessments, much like vital signs are for elderly patients admitted to acute care hospitals, ICUs, and long term care facilities. Detection and documentation of delirium remains erratic and falls largely to the nursing staff, as they spend more time with patients, thus putting them in the position to notice early cognitive changes in patients under their care. Since delirium is not charted or identified as such in medical records, standardized documentation is essential to ensure accuracy and to prevent compromised patient care. The United Kingdom's National Institute for Health and Care Excellence recommends that practitioners "think delirium" to prevent, diagnose, or treat the condition. 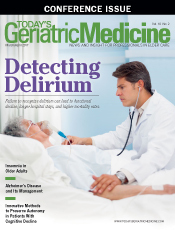 Standardized formal cognitive assessments enable practitioners to identify and treat patients with potentially reversible causes of delirium.13 Several validated and reliable tools for delirium detection have been developed, but health care providers, nurses most notably, must be knowledgeable in how to implement them. The tool used to detect delirium must be suitable for the practice area, and education on proper use of the tool is an essential factor in documenting the baseline and ongoing cognitive assessments. Maybe it's time to start looking to the environment in which health care is practiced for our answer. Vahey et al verified that on units where nurses had adequate staffing, resources, and administrative support, patient outcomes and satisfaction were improved. The knowledge that inadequate practice environments have a negative impact upon patient outcomes should prompt administrators to provide quality patient care through adequate staffing. This would enable nurses to have both the time and resources to devote to elderly patients and enable them to provide care specific to those needs.19 Our elderly population deserves need-specific care and health care professionals who have the time, training, and resources to adequately care for them. — Mimi Kovaleski, MSN, RN, ACNS-BC, CCRN, is a faculty specialist in nursing at the University of Scranton in Scranton, Pennsylvania, and a full-time doctoral student at Duquesne University in Pittsburgh. Her interest lies in improved delirium care for the geriatric population. 1. Leslie DL, Inouye SK. The importance of delirium: economic and societal costs. J Am Geriatr Soc. 2011;59(Suppl 2):S241-S243. 2. American Delirium Society. 2015 Delirium is a dangerous syndrome. https://www.americandeliriumsociety.org/resources. Published 2015. Accessed December 16, 2016. 3. Inouye SK, van Dyck CH, Alessi CA, Balkin S, Siegal AP, Horwitz RI. Clarifying confusion: the confusion assessment method. A new method for detection of delirium. Ann Intern Med. 1990;113(12):941-948. 4. Grover S, Kate N. Assessment scales for delirium: a review. World J Psychiatry. 2012;2(4):58-70. 5. United States Census Bureau. Welcome to quick facts. https://www.census.gov/quickfacts/. Accessed December 15, 2016. 6. Steis MR, Fick DM. Delirium superimposed on dementia: accuracy of nurse documentation. J Gerontol Nurs. 2012;38(1):32-42. 7. McCaffrey R, Locsin R. The effect of music listening on acute confusion and delirium in elders undergoing elective hip and knee surgery. J Clin Nurs. 2004;13(6B):91-96. 8. Conley DM. The gerontological clinical nurse specialist's role in prevention, early recognition, and management of delirium in hospitalized older adults. Urol Nurs. 2011;31(6):337-342. 9. American Psychiatric Association. Diagnostic and Statistical Manual of Mental Disorders, Fifth Edition (DSM-5). American Psychiatric; 2013. 10. Middle B, Miklancie M. Strategies to improve nurse knowledge of delirium: a call to the adult-gerontology clinical nurse specialist. Clin Nurse Spec. 2015;29(4):218-229. 11. Zalon ML, Sandhaus S, Kovaleski M, Roe-Prior P. Hospitalized older adults with established delirium: recognition, documentation, and reporting. J Gerontol Nurs. 2017;43(3):32-40. 12. Young J. The recognition and diagnosis of delirium needs improving. Guidelines Pract. 2010;13(10):19-31. 13. Duffin C. Professionals, failure to spot delirium prompts guidance. Nurs Older People. 2010;22(7):6-7. 14. The American Geriatrics Society 2015 Beers Criteria Update Expert Panel. American Geriatrics Society 2015 Updated Beers Criteria for Potentially Inappropriate Medication Use in Older Adults. J Am Geriatr Soc. 2015;63(11):2227-2246. 15. MacLullich AM, Hall RJ. Who understands delirium? Age Aging. 2011;40(4):412-414. 16. PTSD symptoms common among ICU survivors. Johns Hopkins Medicine website. http://www.hopkinsmedicine.org/news/media/releases/ptsd_symptoms_common_among_icu_survivors. Published February 26, 2013. Accessed December 16, 2016. 17. Schwartz A. More common and more harmful than once believed, delirium takes center stage. University of California San Francisco Science of Caring website. http://scienceofcaring.ucsf.edu/patient-care/more-common-and-more-harmful-once-believed-delirium-takes-center-stage. Published February 2016. Accessed December 16, 2016. 18. Byrne MD, Lang N. Examination of nursing data elements from evidence-based recommendations for clinical decision support. Comput Inform Nurs. 2013;31(12):605-614. 19. Tei-Tominaga M, Sato F. Effect of nurses' work environment on patient satisfaction: a cross-sectional study of four hospitals in Japan. Jpn J Nurs Sci. 2016;13(1):105-113.